Disclosure: This is a non-compensated post. Just wanted to share! 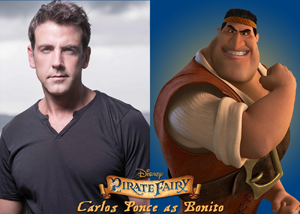 HOLA BONITO – Disneytoon Studios called on actor/singer/composer Carlos Ponce to fill the shoes of sensitive pirate Bonito in “The Pirate Fairy.” Serving as rigger alongside James and Zarina in the film, the huge Spaniard can throw a harpoon a hundred yards. But Bonito is quite passionate about sewing, not only the ship’s sails, but also applying dainty double-stitched seams to his fairy captain’s tiny outfits. The swashbuckling new adventure about an ambitious, but misunderstood dust-keeper fairy who joins forces with a band of pirates sets sail April 1, 2014.